Keep in mind as you browse through these photos that there was never a fatality, never a serious injury, and every skydiver landed safely under their own parachutes. These photos are all from Bowling Green, Missouri the location of Skydive St. Louis (1990-1999); an operation that could boast the best skydiving safety record in the region ( zero fatalities and zero serious/permanent injuries in over 75,000 skydives). But the negative financial impact of every aircraft situation was incredible. The following stories describe the handful of incidents from over 25,000 aircraft flights that severely slowed the growth of Skydive St. Louis throughout the years. Lew Welzel and Rick Eddy had just purchased Skydive St. Louis from Bill Hayes and Tom Gettemeyer, which had only been a one-airplane dropzone for years. We flew in the Cessna 205 from Colorado in early May to be the second airplane, which would more than double our capacity (5 jumpers in the 205). Our pilot, George, got to fly the 205 for the first time that day, and certainly enjoyed flying the 205 for about 6 hours that day, and there were many people who came to the operation that day to enjoy the extra jumping opportunity with the 205. By the way this was actually in Jonesburg Missouri; about 45 miles south of BG, when we were first located there in May of 1990. On the last flight of the day we flew both airplanes in formation together in an attempt to fly a 9 person skydiving formation in freefall. We made the skydive, and the skydivers land. The Cessna 182 lands and then George flies the 205 low over the airport. At first we think he is just having fun, but we soon realize that the sun has set and he can not easily see the unlit gravel runway. George is also worried about running out of fuel. We rush out to the runway with several cars to try and illuminate the short strip. George misses the runway by 5 feet and slowly lands the 205 in the mud next to the runway. The 205 slows down and almost comes to a stop; but then the nose gear sinks into the mud and the airplane slowly flips up about 95 degrees, and then falls forward onto its back. George is upside down in the seat, buckled in. He releases the seatbelt, drops to the ceiling, and climbs out of the airplane without a scratch. The 205 is a ‘total’, and the insurance money ($19,000) went to the parent operation, Skydive Colorado, which desperately needed the funding for Cessna 206 engine problems at the time in Colorado. 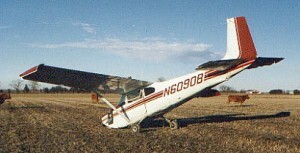 Damage Estimate – $19,000 direct loss to the operation; Skydive St. Louis was limited to one airplane for the next 2 years. Estimated value unknown. Story behind the story. The FAA investigated the accident and decided that the pilot did not need to be suspended, but that it was a good idea for him to go through some refresher training in night flight procedures. George ignored them (the FAA), and tried to hide from them. A year later George flies our Cessna 182 to the St. Louis area for a demo jump/flight, and while he is there he encounters an FAA official who is doing general airplane/pilot inspections. The FAA official tells George he remembered something about a pilot out our way that he had been trying to find. The FAA man asks George if he knows anything about a 206 accident near Jonesburg? And George looks him straight in the face and says, “No sir, I don’t know anything about a 206 accident.” And walks away. Fortunately, we had a very experienced pilot who remained calm. Steve Hult, flight engineer for TWA and one of our frequent pilots, was flying our Cessna 182 (N5015D) and had four skydivers including a recent graduate from our training program who was using some rental equipment. While the novice skydiver/recent graduate (Bob) was climbing out of the airplane and standing on the step over the wheel, a pin came loose on the parachute equipment that holds the reserve parachute in place. The parachute inflates in less than a second and yanks Bob off the step. Gravity pulls Bob well below the tail of the airplane, but the parachute briefly snags part of the tail – bending the tail and twisting it until the parachute drops off. Bob lands hard, but safely under a round emergency parachute in some trees about two miles away from the airport. But up in the sky, Steve Hult is the only one left in the damaged airplane. Everyone else has safely jumped. Steve never looked back to see the damage, but he sampled the control range of the airplane while he flew it straight and level. Steve radioed down to the ground to tell us about his situation, and that he was going to fly around to try to burn up most of his fuel. He didn’t nose the plane down, but instead reduced the power so that the airplane slowly descended while flying level. We called the emergency squad of BG and they had all kinds of rescue equipment lined up next to the runway by the time Steve came in to land. We were ready for a crash! Instead Steve Hult was at 200 feet about two miles away and slowly brought the airplane in for a slow and soft landing. No one had a scratch. Damage Costs – $5000 to repair, 3 weeks down time in October. Too bad we didn’t have a more experienced pilot flying our Cessna 182. Mark was flying while a recent graduate, Steve, climbed out onto the step of the airplane. The pin on his reserve came loose, due ultimately to a manufacturing error by the equipment manufacturer. The square reserve parachute deploys and yanks Steve off of the airplane, and gravity pulls him below the tail. The parachute catches somewhat on the tail of the airplane until it pulls back and twists the tail until the chute comes loose with minor damage. All the skydivers safely jump and land under their parachutes, and Steve lands his reserve in a nearby field. Mark, the pilot, has some difficulty keeping the nose of the airplane down, so he assumes that will not be a problem on landing. He fights the airplane and gets control to put it into a normal fast descent. Before the jumpers have landed and can communicate the problem to the people on the ground Mark is bringing the airplane in for a landing. He turns the airplane at 1000 feet and then finds that the nose doesn’t want to come up for him. Mark turns the airplane and crash lands it nose first in a nearby field. Mark gets out of the airplane and walks back to the hangar. Story behind the story. This Cessna 182 we had just bought from a place in Oregon a few months before, and we had invested quite a bit of labor and parts to get it into acceptable condition. And it was not insured. So it was a total loss, and cut our airfleet of two airplanes in half once again. Several months later Ken Callahan strapped together the pieces of the airplane and drove them on the back of a truck all the way to Loveland Colorado (900 miles one way) just to help the dropzone. The operation in Colorado spent about a year reworking the airplane with other parts and later it returned to our operation in BG as N4090D. Another Story behind the Story. Three years later we learned that this incident was covered by USPA membership insurance because Steve was a member when the chute hit the airplane. An insurance investigator agreed that it should be covered and we received a payment of $18000 three years after the fact. This helped us survive the winter of 1997 when there were no funds remaining to get through the winter months of St. Louis Missouri. Mark had crash landed and totaled one of our two Cessna 182’s on the last day of our operations in 1994. In March of 1995 the weather was unusually warm and we decided to open the operation early that year to try to get more income to help our airplane situation. On the seventh flight of the first day of operations, our pilot Russ was descending our Cessna 182 (N5015D) for a normal landing with an observer riding in the airplane. The observer was the wife of one of our skydivers, and she was learning how to fly herself at the time. At 1000 feet as Russ was flying parallel to the runway to come in for the landing, he ran out of fuel (the FAA’s ruling later) or for some other reason the engine stopped. Pilots in this situation are trained to immediately turn and land the airplane ASAP since it has no power. Russ was surprised by the situation, and instead tried to restart the engine several times. When Russ realized he could not restart the engine, he turned the airplane to land – but found that he was now 1 mile from the runway. 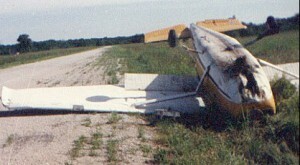 Russ crash landed the airplane ¾ of a mile from the runway he had been right next too at a safe 1000 feet. The airplane hit a small tree and fence post. Russ hit his head on the instrument panel, and the woman had stuck her arms straight out to brace for a crash and thus broke a bone in her arm/shoulder, and bruised several muscles. Russ was taken to the hospital for observation, where the junior weekend staff at the local hospital administered the wrong medication which put Russ into a coma for 3 days and took him several months from which to recover. This incident crashed our last airplane, and it appeared as though we would be out of business. 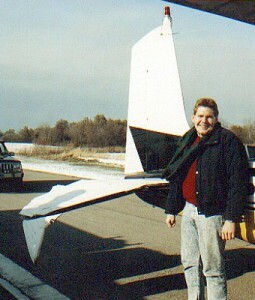 Then 2 months later a group of 8 skydivers got together and loaned Skydive St. Louis enough money to purchase yet another Cessna 182 (N4916D), and we spent the remainder of 1995 operating with just one airplane – again! Story behind the Story. This airplane was not insured, and so it seemed a total loss at the time. However our new airplane needed many of those parts, as did the airplane that was being rebuilt back in Colorado. We also rebuilt the engine and resold it, so we eventually recovered about $20,000 worth of parts etc. Of course there was no way to recover the loss of business, the greater debt incurred by buying another airplane on loan, or the effect on the operation’s reputation. In 1997 we had two good 182’s flying, and we needed a larger airplane. We sold one of our Cessna 182’s (N4090D) and purchased a Cessna 411 twin engine airplane that could carry as many as 10 skydivers and go to 14000 feet above ground. The airplane was a fine plane, but it had a dubious reputation among pilots and mechanics who did not have personal experience with the airplane. By July of 1997 the plane was rebuilt and ready for flight. On the very first flight, Rick Eddy decided to have only six jumpers on board, and that he would be the only diver to stand outside the airplane while the others would dive down to him on the exit. The pilot, Mike, had been told by other 411 pilots to fly the airplane at a somewhat fast speed (106 mph) and with the flaps up. Actually this information was incorrect, but Mike had remembered it wrong. In addition, there was a pinhole air leak in one of the instrument air lines so that when the door of the 411 was opened the air pressure changed So that the speedometer read 10 mph slow. Mike noticed that the airplane was slow when Rick opened the door, so he speeded up to what turned out to be 116 mph. 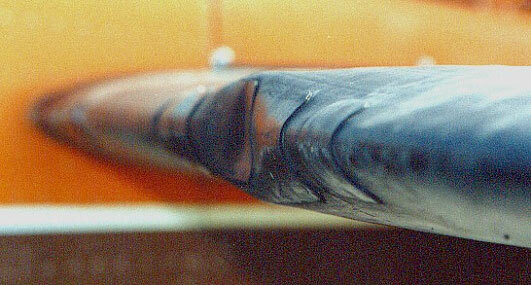 When Rick released from the airplane the wind and the speed and the angle of flight allowed him to drift backwards and he hit the tail of the airplane with his helmet, which put the large dent in the tail that the picture shows. Rick was knocked unconscious, and was a limp body falling through the sky. Only Mike, the next diver in the door, had seen what had happened. As all the divers exited Mike dove down to try to catch or somehow help Rick. After about 20 seconds Rick recovers by himself, turns over and begins the skydive with the others as planned. The 6 person star formation is completed just before breakoff time, and Mike notices during the dive that Rick is not smiling, as he normally does. Rick turns as the correct time and safely opens the parachute and comes down for a landing, completely recovered, and completely unaware that anything has occurred. Mike lands and runs up to Rick, asking if he is OK. Rick says, yeah, why? Mike takes Rick to the airplane and they see the dent. If not for the hard plastic helmet that Rick wears all the time, the incident could have been fatal. Instead there wasn’t even a scratch. Story behind the story. After calling several hospitals within the hour, Rick decides that there is no concussion, and no reason to go to the hospital. A few minutes later Rick suits up and puts on a heavy camera helmet on his head and rides up on the next flight to film a tandem skydive! No problem. When we entered 1999 we had finished all the work on our Cessna 411, and our Cessna 182 was in great shape. We were ready for a great season. Our only problem was personnel: our main pilot for several years had been hired by TWE, and we needed another chief pilot. In May we hired a pilot who had twice as much experience as our former pilot, but an immature personality and little common sense. Eric, the new pilot struggled to learn to fly the airplane correctly, and on his 3rd week after he had dropped a group of divers, he forgot to put the landing gear down when landing the airplane. A simple mistake that screwed us quite a bit because it was our primary airplane, and it was at the beginning of the season. Although the airplane repairs were covered by insurance, it took 3 months from the heart of our season to repair the airplane and by then all of the event plans for the operation had gone away. Story behind the story. Eric, the idiot pilot, was told by the FAA that he didn’t have to come out and meet them at the airport for an inspection as long as he submitted a written report to them about the incident. Eric decided to blow them off and not do it. Several weeks later the FAA suspended him for a few months to teach him a lesson. From reports of his flying since then the lesson did not stick. Well, these are the primary airplane incidents that happened at Skydive St. Louis. It is incredible that we were able to stay in business all those years. This does not include the four airplane engines that we had to prematurely replace between 1992 and 1995 that each cost about $15,000 (total about $60,000), and months and months of downtime waiting for repairs awhile only using one airplane. Of the four engines two were badly damaged by pilot abuse, one by a poor rebuild, and one by a simple honest mistake of replacing a cowling screw with a long one that vibrated into the engine and emptied all the oil in flight. Looking back at all this it is amazing that we remained in business. How I’m not sure. Why I’m not sure, but we did it. In the end the operation closed because of the nationwide problem of attracting skydiving staff to work at the operations. The staff shortage led to the formation of Skydive Zion in St. George Utah in 2000 – a much smaller operation to focus more on the training aspects of skydiving rather than a full service high volume operation. To date, the only airplane problem in Utah has been replacing two radio transistors – cost, $80.